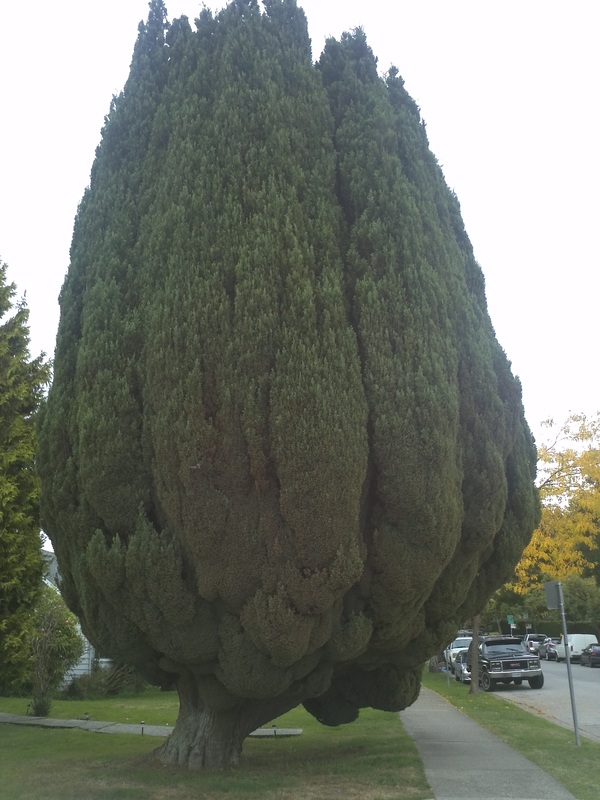 Living in Vancouver for the better part of my life heightens expectations regarding “green spaces”, trees, and shrubbery. I’ll never forget the private belly laugh sparked by the visiting American who blurted out ” what the hell is with all this shrubbery?” , clearly flabbergasted by carefully manicured hedges lining our city streets. We have strict laws regarding trees – none can be cut down without a permit, even if on private property. For every tree removed, five more must be planted. Mild winters and early springs are perfect for blossoming varieties; a great deal of thought goes into placement of cherry, plum, magnolia, and hawthorn. The city places trees for optimum visual effect, regardless of the season. My street has everything from plum and oak to sumac. 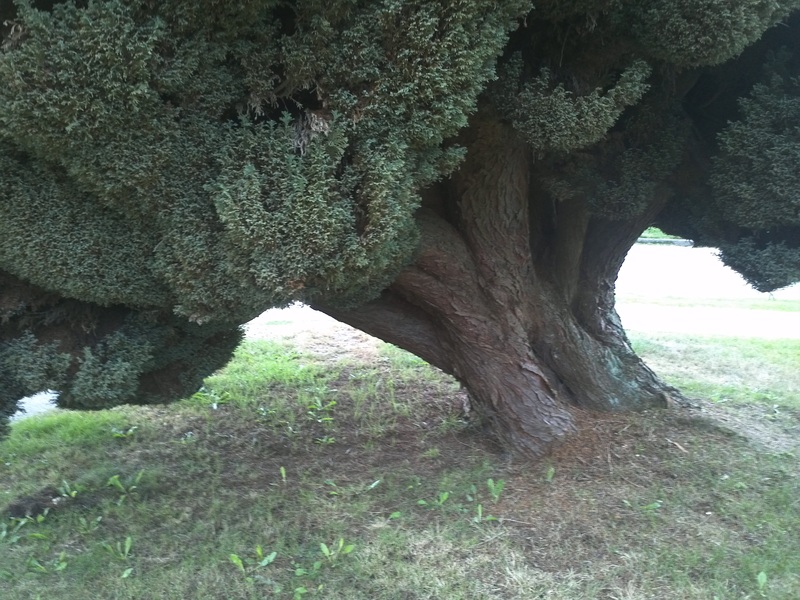 If asked to imagine a tree, few people would picture anything like the “fairy tree” in my front yard. These pictures taken on my phone can’t begin to do this tree justice. Barely a week goes by without spotting someone stopping to capture the impossible dimensions and odd tilt of this giant. I’m not a great judge of distance but would guess it was around thirty feet tall. The height is irrelevant; my tree decided decades ago to dismiss convention – why grow tall when you can grow wide and defy gravity? Little imagination is required to understand why my young children thought of it as the fairy tree. Twisted branches rope around an ancient trunk, leading towards the inner sanctum. Generations of soft foliage cushion nooks and crannies within its cavernous interior. No amount of rain, wind or snow can make their way past its defences. My children are adults now; busy lives leave little time for peeping inside the fairy tree. A few years ago a pair of ducks decided to make it their home; they materialize in spring – I always know when they’ve moved in because at 6 PM every evening they emerge to waddle down the street. At first I pondered – what duck would choose to live in a tree? Then I reminded myself; this is the fairy tree. 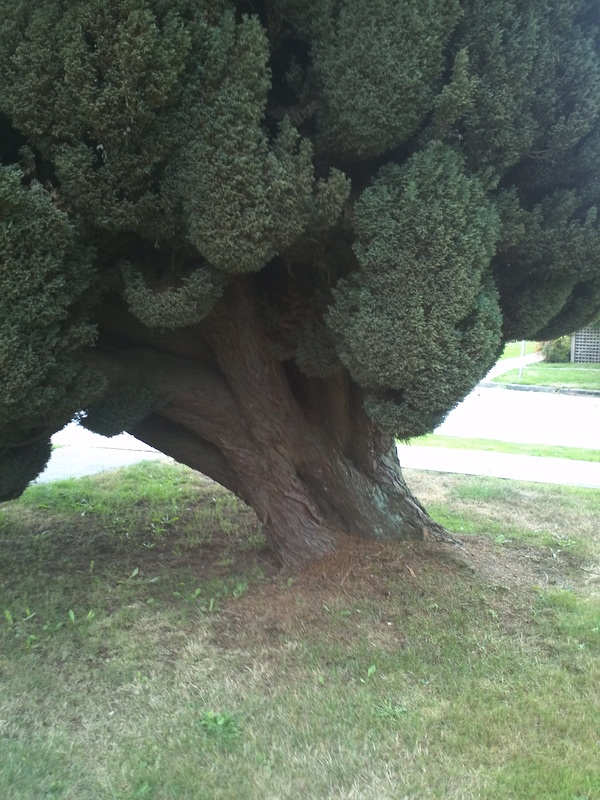 This entry was posted in Canada, Family, Life, Nature, Opinion, Our World, Postaday, Writing and tagged Botany, Fairy, fairy tree, Gardens, Plant, Tree, Vancouver. Bookmark the permalink. Great idea for every tree cut down five more must be replanted. A very majestic and magical tree. Wow…you guys have some pretty strict rules regarding trees! I love the “fairy tree”. We are indeed products of our environment. I too live in this beautiful city. Imagine that! 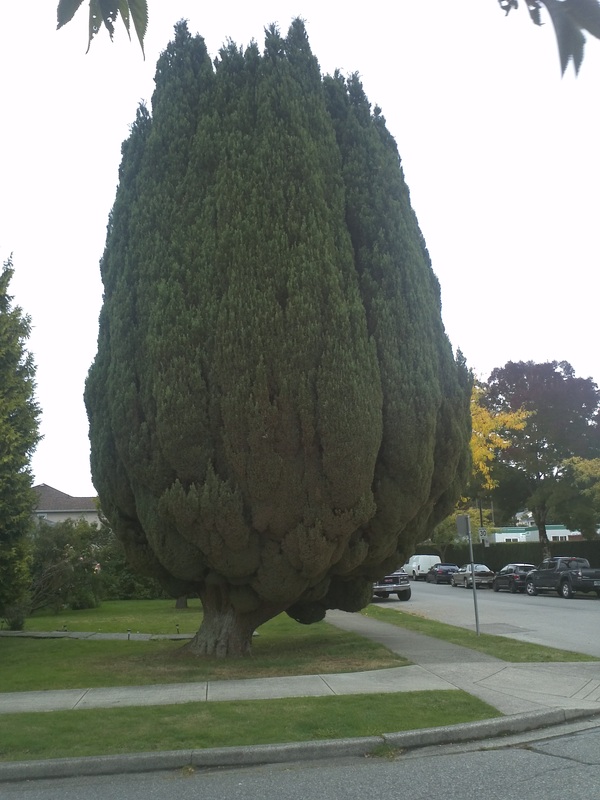 I always take visitors on a tour on the city just to see the variety and majesty of the trees that exist here. Typically, they are so amazed . Trees are just one of this city’s many natural beauties. I confess, I’m rather fond of the mountains. Fairy tree? Perfect name, for I can just imagine all the ‘fairies’ tales children create around it .Lovely photo, and it does capture its uniqueness. This makes me happy. At the beach where I grew up, we had live oaks everywhere. They grew bent and twisted by the ocean wind, which meant their sideways branches grew perfectly for little ones to climb! Love the five for one policy! When my dad was still alive we had a family owned apartment building and when he got his very first riding lawnmower he went around cutting down SMALL trees on the property…. about 5 of them. Over the years every time they would go on vacation I would plant another tree — I eventually replaced his 5 cut trees with 21 replacements — 12 of them I got from our city for free as a bare-root tree-planting program and they were 12′ tall when I got them. He groused and complained about having to go around in circles while cutting the trees but never touched a branch on them. After a few years he even came to love them. It’s interesting the strange things ‘technology’ — in that case the advent of the riding lawnmower — convince us are the ‘right’ things to do…. I wonder what aberrations the technology of the next generation will cause citizens to do? I love this. Thanks for following me and for introducing yourself to me on my blog! I’ve sent you an email, and look forward to following you. Going to enjoy exploring all you’ve written so far…..
What an enlightened civic approach to the enviromnent! That is a weet story. Is the tree still there, I wonder. Where is this located? I’ll visit the fairies and take a photo. Vancouver’s recent wind storm, a dozy responsible for 710,000 homes without power, has me pondering how lucky I was not to lose my tree. I love trees. I once heard that Johannesburg is supposed to have more trees in and around the city than any other major city in the world. We have similar laws. Sadly they are not always abided by. Likewise. Certain immigrants for example consider it bad luck if a tree casts shadows at the front door. He claimed it was an insurance risk being so close to his house. As a rule I wouldn’t mind ( they are not indigenous after all) but it had stood for so long, was a landmark and the sod did not plant anything in its stead.